system to regulate simultaneous release of both agents in bioactive concentrations. major influence on the reduction of in-stent restenosis. site of action following oral or systemic administration. ting the incidence of ISR and IST. becomes insoluble and precipitates out of solution . shift occurs in relation to NiPAAm is between 31-34˚C. tios of NiPAAm/NtBAAm (85/15, 65/35 and 50/50). up to 60 days with retention of bioactivity. embedded in an 85/15 copolymer containing fluvastatin. were of the highest grade commercially available. bisacrylamide (0.02 g) were dissolved in 36 ml of water. to 70˚C. The solution was degassed by bubbling with N2. 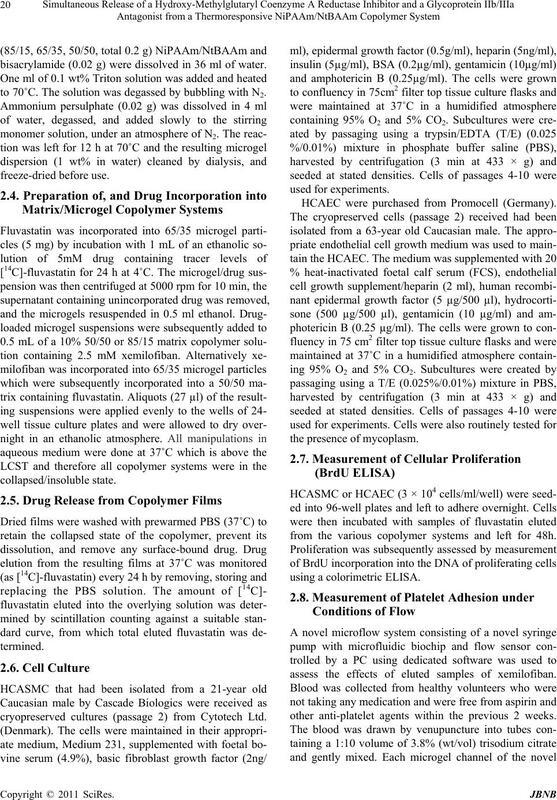 cryopreserved cultures (passage 2) from Cytotech Ltd.
HCAEC were purchased from Promocell (Germany). from the various copolymer systems and left for 48h. assess the effects of eluted samples of xemilofiban. other anti-platelet agents within the previous 2 weeks. in an 85/15 copolymer containing fluvastatin. the number of platelets within each illustrated quadrant. followed by Bonferroni’s multiple comparisons post-test. The statistical package PRISM was used for all analyses. mer matrix containing xemilofiban over a 14-day period. 24-well plates and after 24 h PBS was added to the wells. S.E.M., n = 3, ***p < 0.001 w.r.t. control. and 51.11 ± 10.26% respectively (Figure 4). 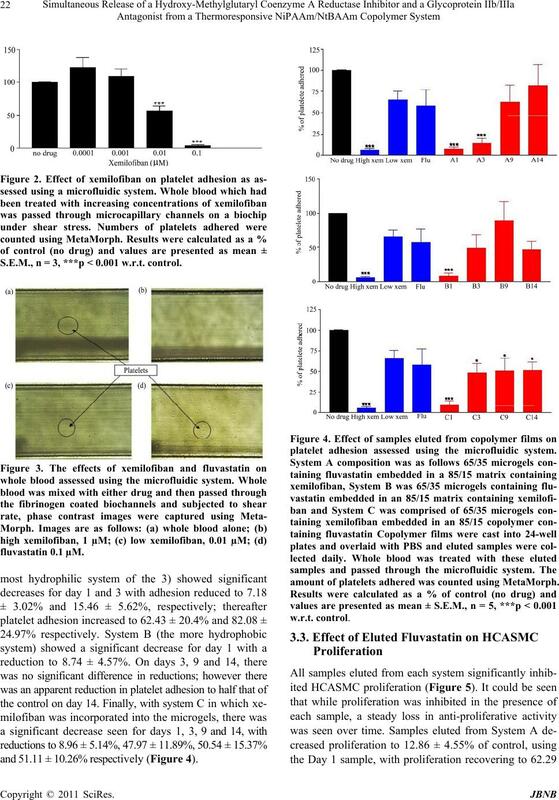 platelet adhesion assessed using the microfluidic system. 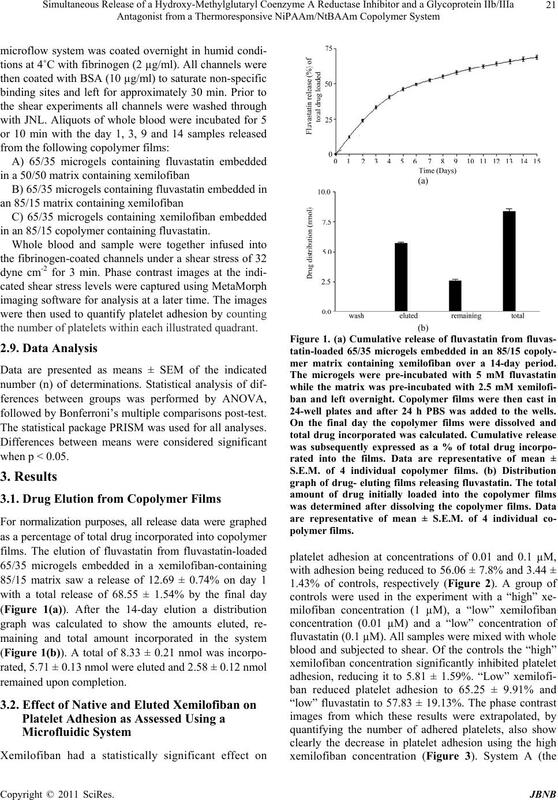 amount of platelets adhered was counted using MetaMorph. w.r.t. cont r ol . 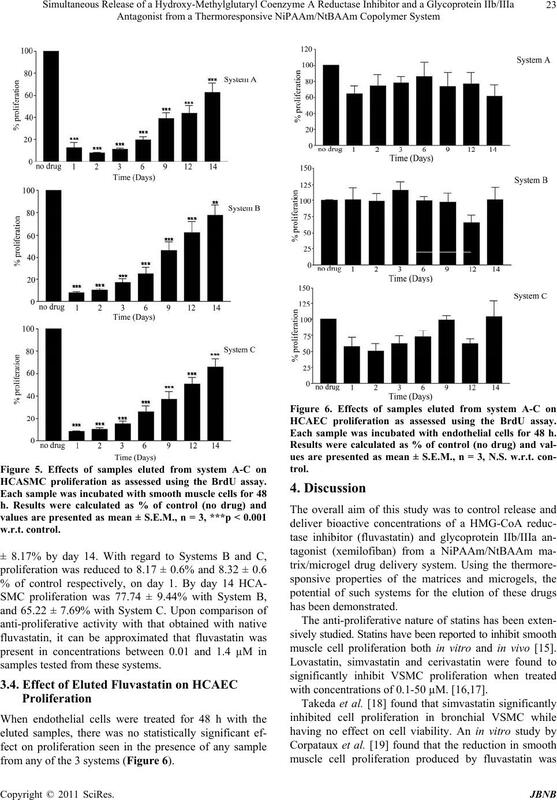 HCASMC proliferation as assessed using the BrdU assay. samples tested from these systems. from any of the 3 systems (Figure 6). HCAEC proliferation as assessed using the BrdU assay. Each sample was incubated with endothelial cells for 48 h.
muscle cell proliferation both in vitro and in vivo . with concentrations of 0.1-50 µM. [16,17]. much more sensitive to these anti-proliferative effects. for a potential candidate for local drug delivery. and then released through a hydrophilic 85/15 matrix. 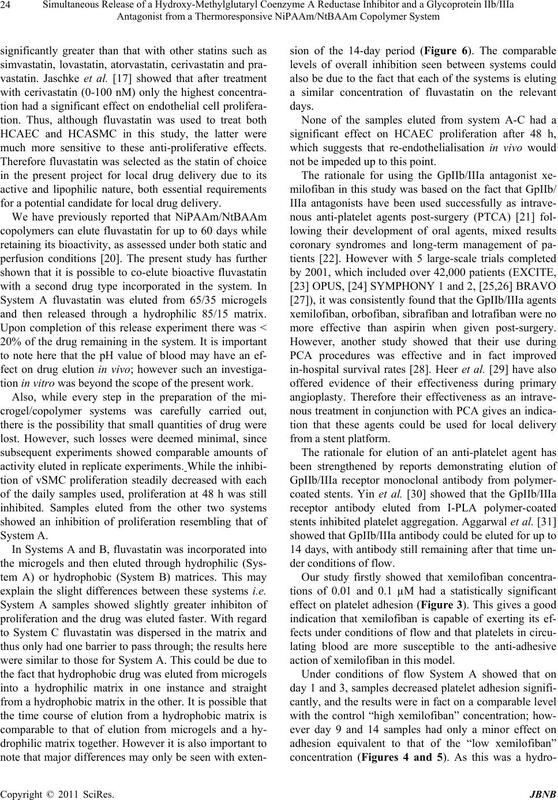 tion in vitro was beyond the scope of the present work. explain the slight differences between these systems i.e. not be impeded up to this point. more effective than aspirin when given post-surgery. action of xemilofiban in this model. leased was beyond the scope of the present study. with a reduction to a level similar to “high xemilofiban”. have continued beyond 14 days. seen with these systems . this work would not have been possible. land Journal of Medicine, Vol. 316, No. 12, 1987, pp. V. A. Voudris, J. S. Skoularigis, Y. K. Dimitriou, G. N.
No. 6, 2004, pp. 353-359.
vascular Interventions, Vol. 55, No. 3, 2002, pp. 409-417. Biotechnology, Vol. 25, No. 12, 2007, pp. 577-583. Vol. 31, No. 3, 1998, pp. 197-221. K. B. Doorty, T. A. Golubeva, A. V. Gorelov, Y. A.
diovascular Pa t hology, Vol. 12, No. 2, pp. 105-110.
licuddy, K. A. Dawson, W. M. Gallagher and A. K.
Vol. 67, No. 2, 2003, pp. 667-673. C. A. Kavanagh, T. A. Gorelova, I. I. Selezneva, Y. A.
medical Materials Research, Vol. 72, No. 1, 2005, pp. Vol. 107, No. 36, 2003, pp. 9629-9637. 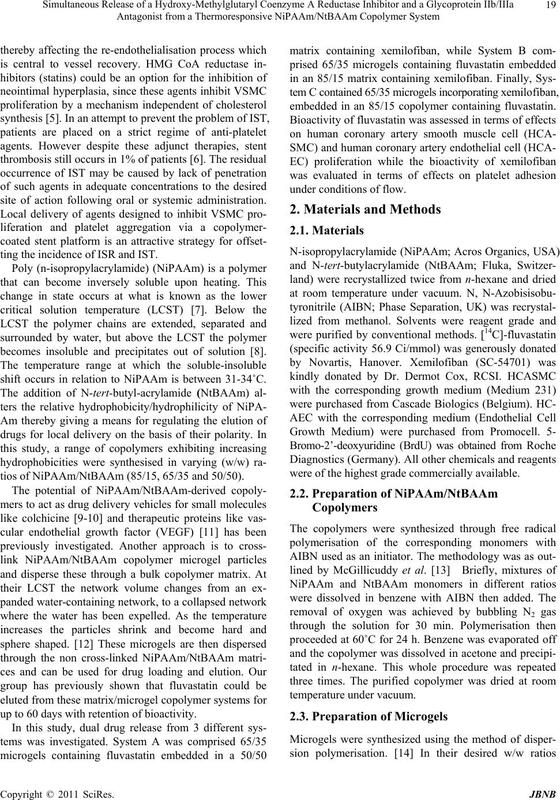 Spectroscopy,” Journal of Applied Polymer Science, Vol. Statins,” Autoimmunity Reviews, Vol. 2, No. 6, 2003, pp. R. Riessen, D. I. Axel, M. Fenchel, U. U. Herzog, H.
in Cardiology, Vol. 94, No. 5, 1999, pp. 322-332. N. Takeda, M. Kondo, S. Ito, Y. Ito, K. Shimokata and H.
lecular Biology, Vol. 35, No. 6, 2006, pp. 722-729. 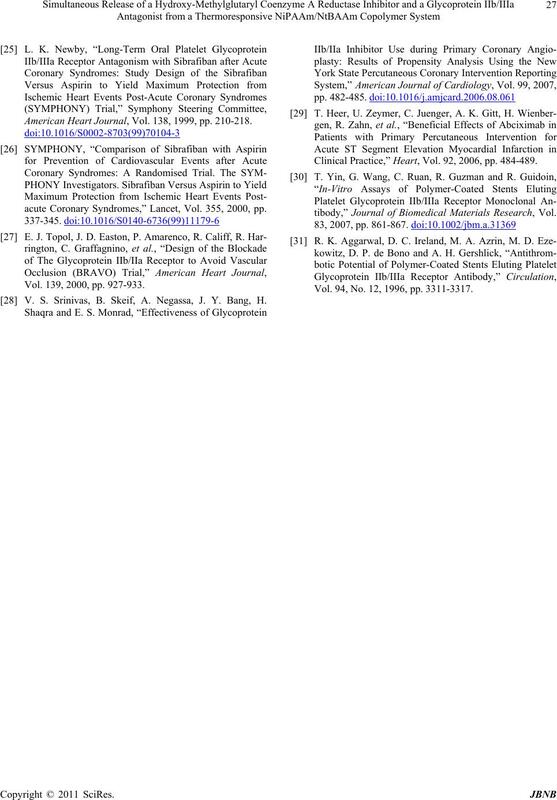 Journal of Surgery Research, Vol. 129, No. 1, 2005, pp. F. C. McGillicuddy, I. Lynch, Y. 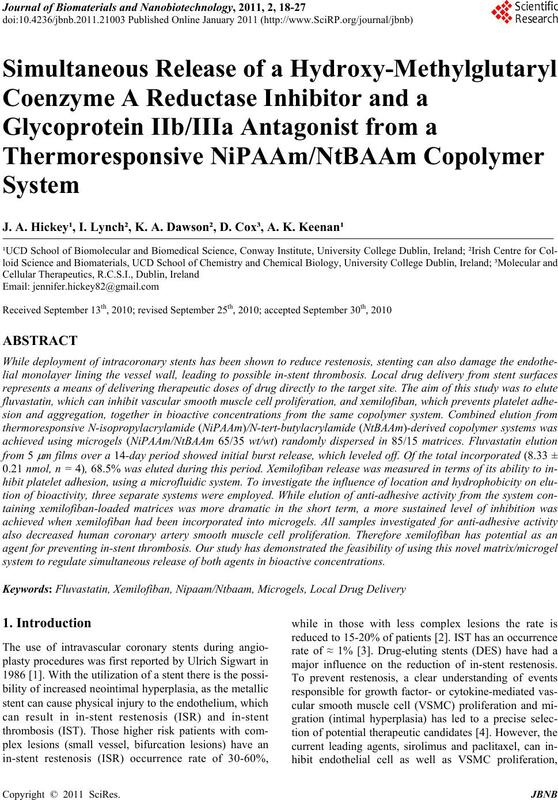 A. Rochev, M. Burke, K.
Biomedical Materials Research, Vol. 79, No. 4, 2006, pp. cular Drugs, Vol. 4, No. 1, 2004, pp. 31-41. W. W. O'Neill, P. Serruys, M. Knudtson, G. A. van Es, G.
Medicine, Vol. 342, No. 18, 2000, pp. 1316-1324. 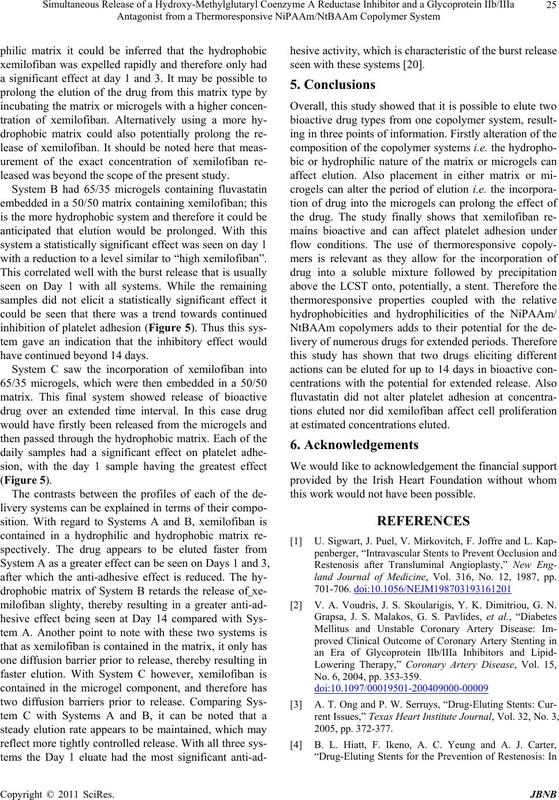 C. P. Cannon, C. H. McCabe, R. G. Wilcox, A. Langer, A.
Syndromes (OPUS-TIMI 16) Trial,” Circulation, Vol. 102, No. 2, 2000, pp. 149-156. American Heart Journal, Vol. 138, 1999, pp. 210-218.
acute Coronary Syndromes,” Lancet, Vol. 355, 2000, pp. Vol. 139, 2000, pp. 927-933. V. S. Srinivas, B. Skeif, A. Negassa, J. Y. Bang, H.
Clinical Practice,” Heart, Vol. 92, 2006, pp. 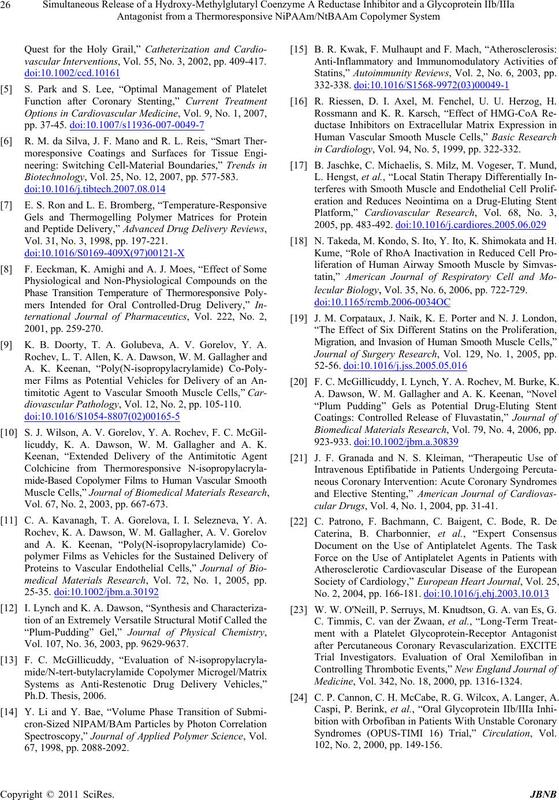 484-489.
tibody,” Journal of Biomedical Materials Research, Vol. Vol. 94, No. 12, 1996, pp. 3311-3317.